To receive further updates on this Target (NYSE:TGT) trade as well as an alert when it’s time to take profits, sign up for a risk-free trial of Strategic Trader today. We are opening a new trade on Target (NYSE:TGT). When our October put write expired in-the-money, we gladly accepted the stock. We’ve owned shares of TGT for two months now. In that time, we have successfully sold one covered call against the stock. Now it’s time to do it again. TGT, along with the rest of the market, has bounced up off its recent lows and is climbing higher. We want to sell a covered call because call premiums are typically much richer when a stock is climbing higher than when it is falling lower. We also think TGT is a great covered-call candidate at the moment from both a fundamental and a technical perspective. TGT is one of the largest retailers in the United States. We are coming off of a holiday shopping season that, according to Mastercard SpendingPulse, saw spending increase 5.1% between Nov. 1 and Dec. 24 compared with a year earlier. This means that consumers spent more than $850 billion this holiday season, with TGT grabbing its fair share. From a fundamental perspective, this should provide some bullish stability for TGT heading into earnings season. The company doesn’t report its earnings until early March, but knowing consumers have been confidently spending has given analysts hope for the coming year. From a technical perspective, we think $60 is a safe support level for now (given the company’s strong fundamental outlook), but we also believe $67.50 is likely to serve as a difficult resistance level to break through. This price level served as support in early 2018 as the stock was forming the “cup-with-handle” formation that it completed in late July. 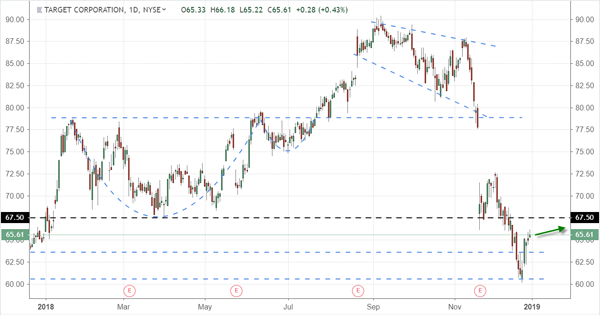 It also momentarily served as support in the aftermath of the company’s latest earnings announcement in late November before finally giving way during the December selloff. Because TGT has such well established support and resistance, we want to take this opportunity to generate income on the stock. When a stock is rising but likely to encounter strong resistance, a covered call can be a great strategy. Article printed from InvestorPlace Media, https://investorplace.com/2019/01/tgt-is-rising-but-there-is-resistance-at-67-50/.